Hipee was always meant to grow up and become the high powered executive and professional bargain shopper she is today. When she was young there was a toy that totally captured her imagination. 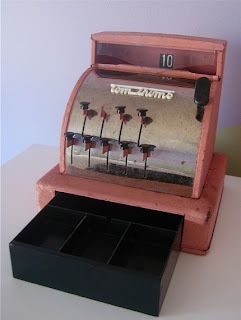 It was a pink cash register. It may have been a Tom Thumb as in the picture. Oh how Hipee loved her pink cash register! She could ring up items on it all day, selling you things, and making (fake) change. She was working on her sales patter and on fostering good interdepartmental relationships even when she was a child. She was always a cheerful cashier and encouraged you to buy more. If your fake money had all been spent, she would open up that pink cash register and give you more. “Will that be all today, m’am? The unspoken part of “please come again” was “immediately” since when Hipee was at her register, she was in her element. She was in the zone. You were required to shop until you drop at Hipee’s store.